ensure that their supervisor/advisor submits a letter of support to the Chair of the Awards Committee, professor Martin Nieto-Perez (m.nieto@ieee.org). The Award entries will be judged on grounds of originality, value to the community, and delivery. The NPSS Fusion Technology Standing Committee will select three finalists from the valid entries. The panel will ask these three finalists to present their work in a 10-minute oral presentation to the judges during the FTSC luncheon at the conference. After this, the FTSC will rank the papers, primarily for technical content and originality. Other criteria such as graphic display and clarity of data presentation may be considered. If there is a tie, tie-breaking criteria is as follows: 1) IEEE NPSS members, 2) IEEE members, and 3) non-IEEE members, in that order. Second and third place will receive an honor mention, and the winner will receive a $500 cash award and a commemorative plaque. Instructions for Student Paper Award Competition. The student must express his/her intention to participate in the Best Student Paper Award by checking the appropriate box during the electronic Abstract Submission process. The student will be notified prior to the conference if he has been selected as one of the three finalists. If this is the case, he/she should prepare a 10-minute summary presentation of the work. 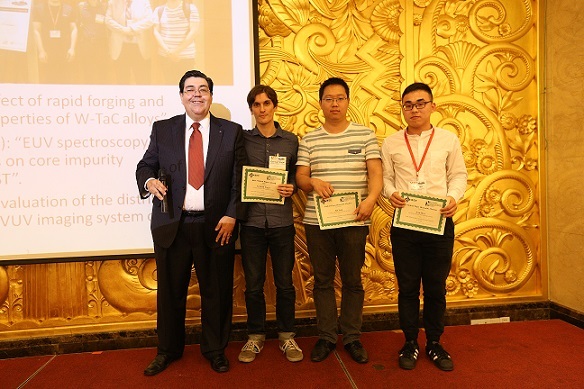 To be considered for the Paul Phelps Continuing Education Grant for SOFE2019, please contact Prof. Martin Nieto-Perez, Awards Chair of SOFE2019, by sending an email to m.nieto@ieee.org with an subject "SOFE2019 Phelps grant"